XM Reviews 2019 - Top Ranked Broker | Is XM One of The Best ? Max Leverage 30:1 *Leverage applies to all the EU regulated entities of the group. Leverage depends on the financial instrument traded. Bonus Offered $30.00 Trade Bonus *Trading Bonus is not eligible for clients registered under Trading Point of Financial Instruments Ltd and Trading Point of Financial Instruments UK Ltd.
Funding Options Credit/Debit Card, Neteller, Skrill, WebMoney, Bank Wire Transfer, etc. Overview: XM Group is a group of regulated online brokers. Trading Point of Financial Instruments Ltd was established in 2009 and it is regulated by the Cyprus Securities and Exchange Commission (CySEC 120/10), Trading Point of Financial Instruments Pty Ltd was established in 2015 and it is regulated by the Australian Securities and Investments Commission (ASIC 443670) and Trading Point of Financial Instruments UK Ltd was established in 2016 and it is regulated by the Financial Conduct Authority (FCA 705428). Accounts: Some traders may appreciate the availability of three account types – Micro trading (with contract sizes of 1000), Standard accounts (contract sizes of 100,000) and the Xm Zero account, first two account types have a min spread of 1 pip where as the xm zero accounts spreads start at 0.0 pips. Traders can ask for a free VPS if they maintain a minimum USD 5000 credit and at least 5 round turn lots monthly. Free demo accounts are available for both account types, with MetaTrader 4 (MT4) and Metatrader 5 (MT5). Islamic trading accounts are also available with either account type. Maximum leverage: 30:1 **Leverage applies to all the EU regulated entities of the group. Leverage depends on the financial instrument traded. Features: XM Group offers MetaTrader 4 and 5 for PC, the web and mobile devices. Clients can trade over 250 financial instruments and the brokers boast high client retention because of the active efforts of the management to visit over 120 countries and engage with clients. Clients enjoy access to free personal account managers, market research, daily technical analysis, and more. Education: XM Group is known for its seminars and efforts to educate clients to help them make better trading decisions. They have hosted over 100 seminars for this purpose. Traders will find webinars, tools, market outlook and more on the website. Deposits/Withdrawals: All major deposit methods are supported including credit/debit card, bank transfer, Skrill, Webmoney And Neteller to name a few. Withdrawals and deposits are one-click and convenient. Customer service: XM Group is customer oriented, and it offers 24-hour help during the trading week. XM.com vs Hot Forex – Who do I trade with ? Both brokers are reputable and similar is many ways. But your looking for the best. Xm.com is regulated in multiply jurisdictions – FCA, CySec and ASIC. All being well respected in the industry. 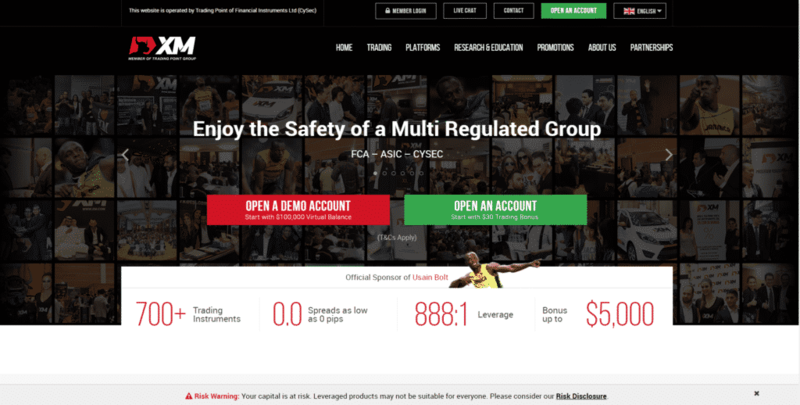 Hot Forex on the other hand is regulated by Cysec as well but also by the FSC. Financial Services Commission (FSC) of the Republic of Mauritius is, in our opinion not a top regulator. Xm.com Canada – Can Canadians trade with XM Group ? No. Xm.com are not able to offer accounts to Canadians because they are simply not regulated within Canada. What is XM.com monthly trading volume ? On average Xm.com’s monthly trading volume is around 415 billion dollars. This is some of the highest volumes among retail Forex brokers. User reviews: Check out more XM Group Reviews below.